Organist and Choirmaster, Kathleen Adams, studied singing at the American Conservatory of Music and organ and conducting at Harvard University. She completed her academic work at the University of Massachusetts, and continued to study singing with master teachers. Specializing in Early Music at the beginning of her career, she sang French, English, and Italian renaissance repertoire with lutenist, David Rhodes. Later performances of song literature have ranged from early liturgical works and chant to baroque, romantic, and modern repertoire. In both Japan and Italy, she has given recitals of classical and sacred song repertoire accompanied by her husband, Jeremy Adams, builder of the organ at the Village Church. As "Caterina la Canterina," she has performed at Italian Fiestas throughout the region, singing Neopolitan repertoire and operatic arias with the Italian Colonial, Saint Alfio, and Italo-American Bands. Locally, she has appeared as soloist with the Cape Ann Symphony and the Cape Ann Community Band. With Gloucester composer, Stephen Scotti, she has performed cabaret repertoire and Scotti's settings of Cape Ann poets. Kathleen served as both Cantor and Organist at St. Leonard's of Port Maurice in Boston's North End for ten years. Moving to the north shore, she served as Registrar at Montserrat College of Art and directed the music program at First Church in Ipswich until her appointment as Organist and Choirmaster at the Annisquam Village Church. 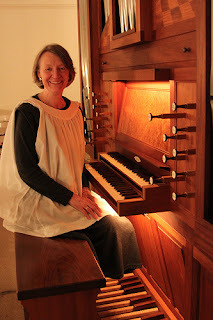 In 2009 Kathleen was elected to serve on the Executive Committee of the American Guild of Organists (Boston Chapter). Five of her organ students have won scholarships through the AGO’s Young Organists Initiative. As Music Director at the Annisquam Village Church she plays and conducts sacred music from many traditions. The concert series she initiated over twenty years ago draws world-class musicians to the church’s exceptional acoustics and instruments. She maintains a private studio as well, teaching voice, piano, and organ. Kathleen also works at C.B. Fisk Organbuilders and is editor of The Pipeline, a newsletter for the firm.